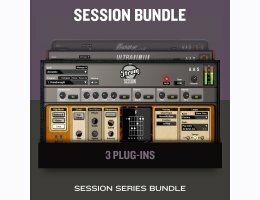 This bundle includes Lounge Lizard Session, Ultra Analog Session and Strum Session. Few Knobs, big Sounds. While the container may be small but these three instruments are really fun to play and pack outstanding sounds. With superb sound libraries with signature presets from producers Richard Devine and Sean Divine. All three of these instruments will match your playing style or musical context with ease thanks to the tap tempo and sync to host clock options; poly- or monophonic with note priority keyboard modes, glide and legato functions and the flexible vibrato. Ultra Analog VA-2 Session's arpeggiator offers various syncing resolutions, playing algorithms, and rhythmic patterns that will spruce up any chord progressions into percolating melodies or pulsing sequences. You'll love the pure raw sound of Ultra Analog Session, but the built-in effects will send it to new heights that you’ll enjoy having them on hand. Strum Session combines an acoustic and an electric guitar in the same package. With chord recognition, chord voicing, strumming and picking action, MIDI riff library, amp and effects, playing guitar on a keyboard has never been so easy. The Demo must be restarted after 20 minutes. Download The Session Bundle Demo Here!